The back of the Feelin’ Groovy baby sweater is complete. I am working on the front, at the point where the pockets would be inset if I were creating real pockets. I’ve spent weeks thinking about and working with these pockets. Who knew pockets could be such a time consuming, weighty issue? I’ve dithered back and forth over type, size, placement, technique, on and on. As I studied the picture I drew, I finally saw that it wasn’t the pocket that was so important. It was the look of the outside trim that broke up the expanse of turquoise fabric. Fair enough. So I jettisoned the actual pocket for just the trim. How to attach the knitted trim is what I am wrestling with now. To knit it directly into the sweater would be too much for most knitters. 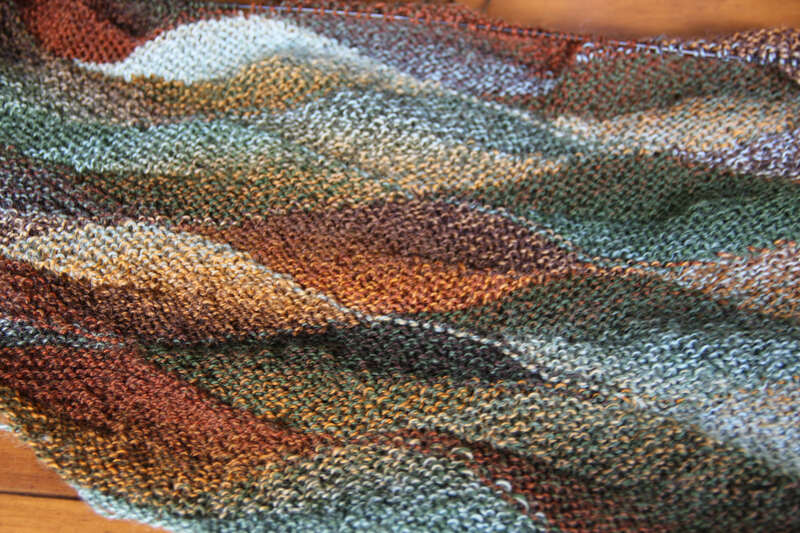 Familiarity with intarsia and stranded color work is a bit much to expect. 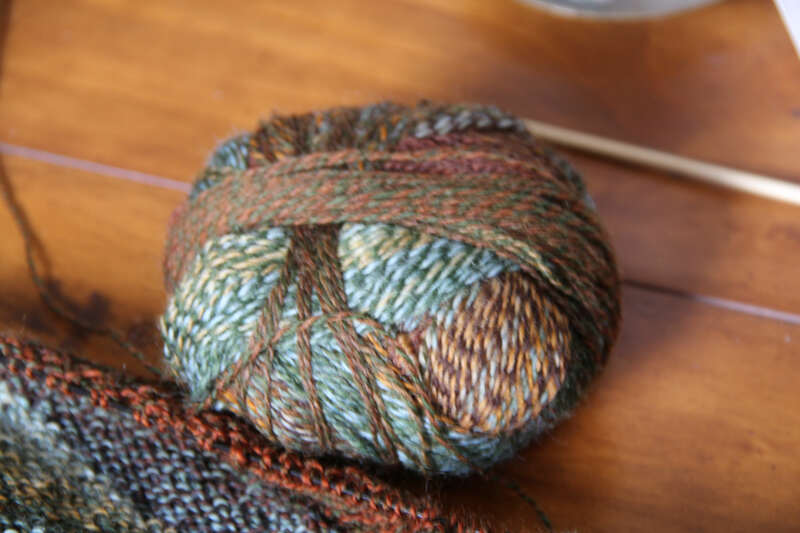 Creating the trim separately on two double pointed needles is a much easier knit because they are only dealing with stranded color work. In the picture the two trims are on two double pointed needles. The best way to place them onto the Front is what I am dithering over now. It’s one thing to draw up a sweater design and another thing entirely to execute it. In the drawing stage I’m not thinking about how to execute the design. I am just going for a certain look. After it’s drawn I think about how to actually create it with yarn and needles. 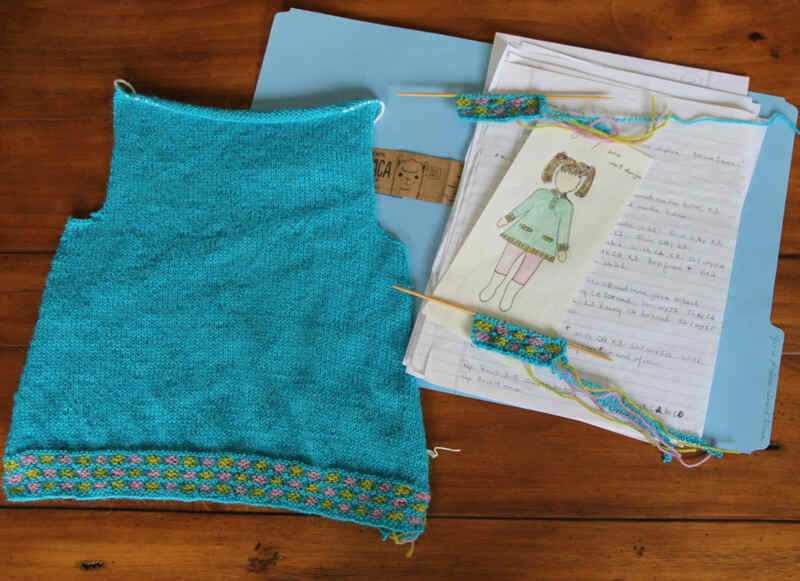 While as the designer I may be willing and able to work more complicated knitting techniques to get the look I want, regular knitters might find these techniques off-putting. Thus the tug of war between design idea and actual 3-D creation. Make it simple but not boringly so. Spice it up with a little interesting technique but avoid over complicated things. 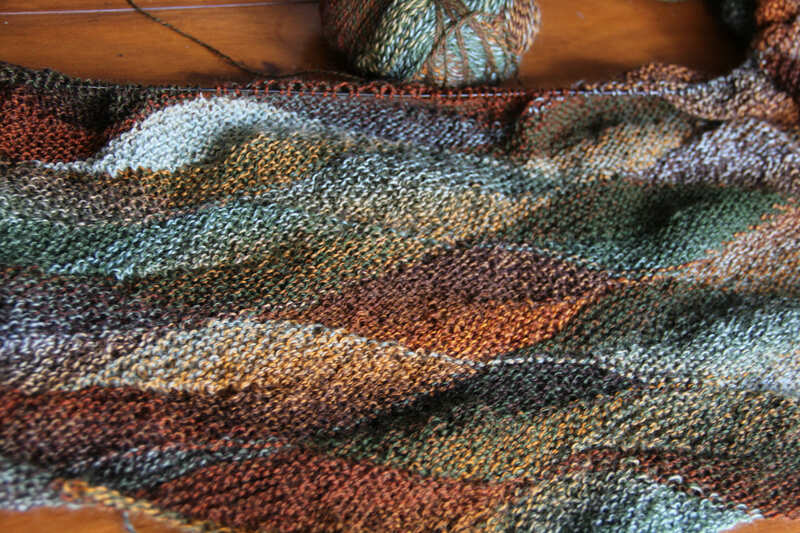 The stranded color work at the hems, cuffs and neck are spicy enough for most knitters. Add shaping for torso, arm and neckline, and throw in a placket and that’s about the limit. The weather continues to march into Spring. The frog is still alive in his abode. For one little frog he has quite the appetite. I’ve told The Skipper that this is the last frog we’re raising. If he brings in anymore tadpoles they are going right back outside. Yarn Rascal is delighted with having the frog indoors. At night he sits for hours in front of the tank watching and talking to it. When it moves he gets all wiggly squiggly. I’ll get all excited when I place the frog outside in the pond. This week is an eclectic mix. From socks that will knock your eyes out, to a pretty fab green coat. I also found embroidery done on knitted items and love the way it looks. Making another debut on the fashion runways are ruffles and not just at the cuffs and neck. Check it out here. Today I am doing something a little different. I am opening up my entire Sunday Images board so you can see what I’ve been hoarding. Each week I will add new pictures to this board and the new items will be at the top of the board. This week has a sweater for all those who hate sewing in sleeve caps. While the garment has sleeves, the caps are missing. Why didn’t I ever think of that? On the fashion side a small glimpse of Dior 2016. Very small sweaters. You can find all this fun here.